Courtney Daglis began her studies at age six, and has enjoyed playing the violin since the early 1990’s. In her formative years Mrs. Daglis participated in numerous honorary orchestras and selective music programs including the Governor’s Honors Program with a major in music, the Georgia Philharmonic, Cobb County Honors Orchestra, Georgia All-State Orchestra, and Georgia State University Honors Orchestra. 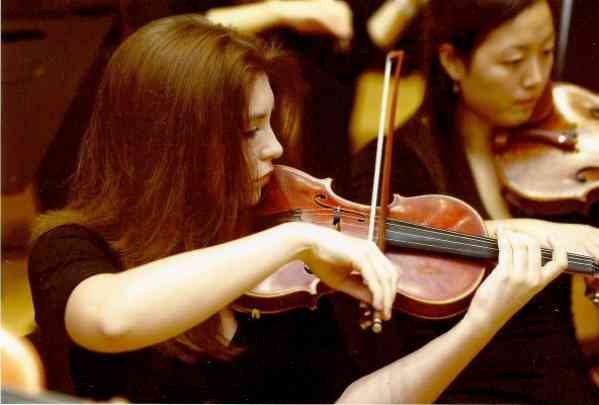 While earning her bachelor’s degree at Emory University, Mrs. Daglis served as Assistant Principal Second Violin with the Emory Symphony Orchestra, led by Pulitzer-nominated composer and conductor Richard Prior. In her performances with the symphony Mrs. Daglis has had the opportunity to be featured in a PBS special as well as to play at New York’s Lincoln Center. Her instructors and mentors include Lisa Yancich, member of the Atlanta Symphony Orchestra, Oliver Steiner, a twenty-year faculty member of the Eastman School of Music, and various members of the Vega String Quartet, an internationally known quartet in residence at Emory University. Having taught the violin and viola for the past decade, Mrs. Daglis is a registered Suzuki instructor through Books 6 and 9/10. She enjoys all styles of music and loves teaching many musical traditions including classical, fiddle (both bluegrass and Celtic styles), jazz, and popular music. Her students have consistently earned membership in competitive youth symphonies and summer programs such as Metropolitan Youth Symphony Orch., Georgia Youth Symphony Orch., KSU Summer Intensive, Atlanta Junior Chamber Ensemble, Cobb County Honors Orch. (including concertmaster position), and All-State Orchestra. Mrs. Daglis is now focusing on the enjoyment of teaching as well as chamber and orchestral performance, since receiving her BA in music with an emphasis in violin performance from Atlanta’s Emory University. In addition to sacred music performances at several area churches, Mrs. Daglis has served in many regional orchestras throughout the southeast, including the cities of Macon, Augusta, Albany, LaGrange, Rome, and Greenville among others. She currently performs with The Celebration String Quartet (2017 Couple’s Choice Award) and recently completed her term in the Suzuki Association of Georgia as the Membership Chair.